For today I’ve gone out and taken steps to give our future robot masters one more way to assert control swiftly and painlessly. In this case my Rovio can control anything that plug's into the wall. I'm using a lamp right now for fun, but I think when I go out of town I might add some speakers to. The just of the mod is that I've set it up so that when I turn on the head lamp using the web controls, an electrical control box with say a lamp plugged in is turned on or off. After it comes on I turn the lamp off or it will drain the transmitter. Then when I turn the LED on again the lamp gets turned off at the wall. Here what you have to do. You will need to open your Rovio up there are 6 screws around the bottom side. 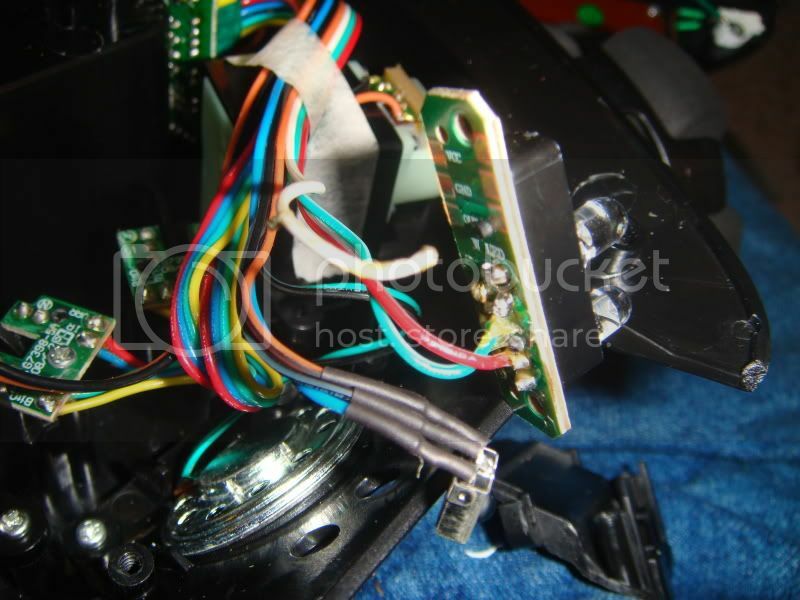 Locate and disconnect the white wire leading to the LED. Be careful leave all of the colored wires as they are. 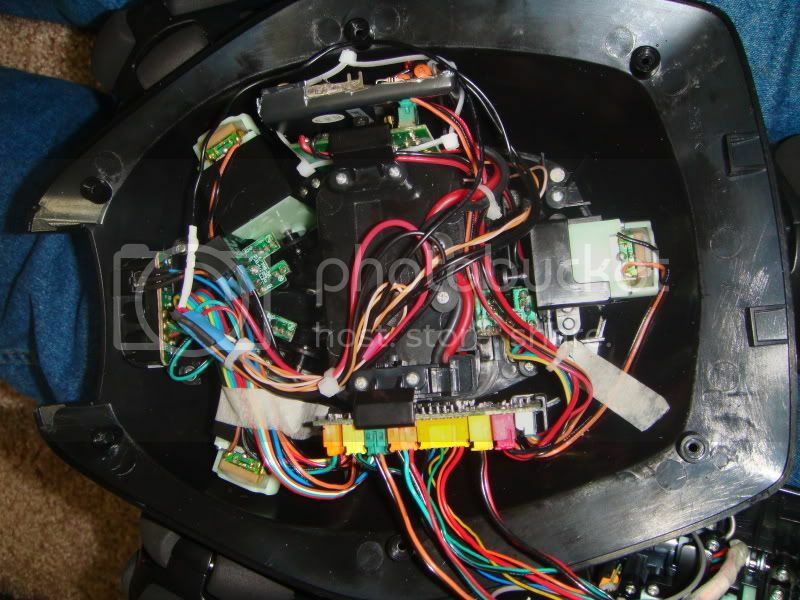 Once the wire is free reassemble and mount the headlamp assembly as this is part of the auto pilot function of the Rovio. Connect the white wire to you Transistors Base pin and set aside. I followed the large red and black wire from the battery to the power board on the right side of the case. Then I removed the 2 screws at the top of the board and pulled it up to examine it. What I found was that there are three pads with penetrations on the board. The Pad in the lower left hand corner of the pad was connected to the red or positive line. And the pad directly to the right of the black or negative line was tied to the black line. I soldered 2 wires, one to each pad and tagged them as two with polarity they where. I then remounted the board leaving the wired hanging out. 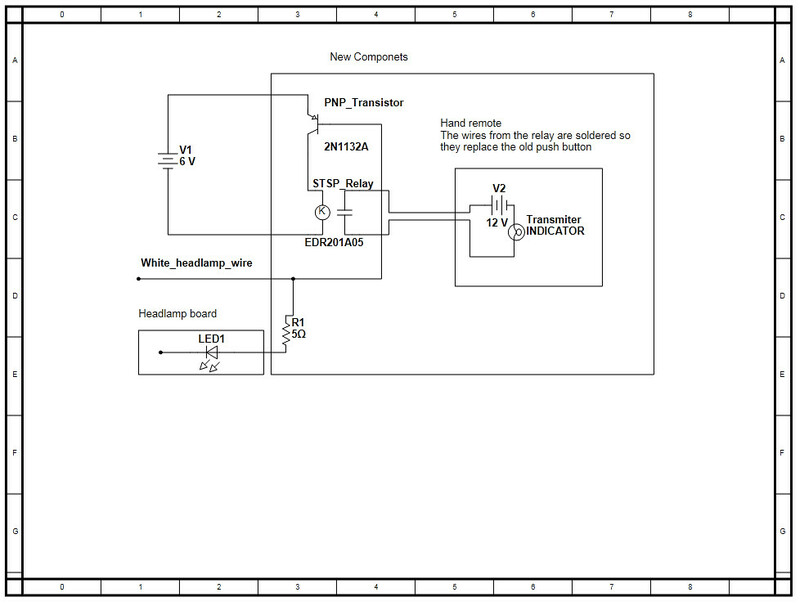 Next you will be attaching the relay to the Transistor and the battery. 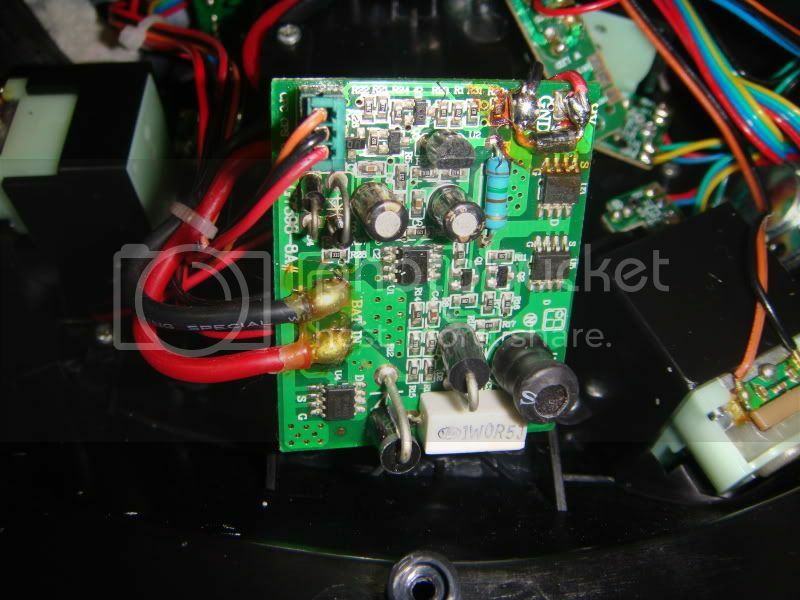 Finally solder your black power wire to the other Relay coil pin. 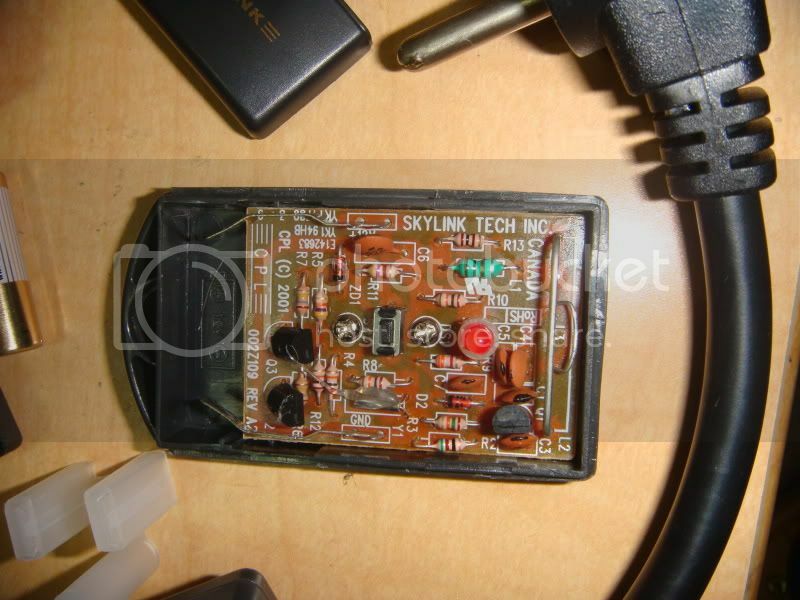 The last part electrically is wiring the relay to the remote. This is pretty strait forward so you can do it how ever you like. 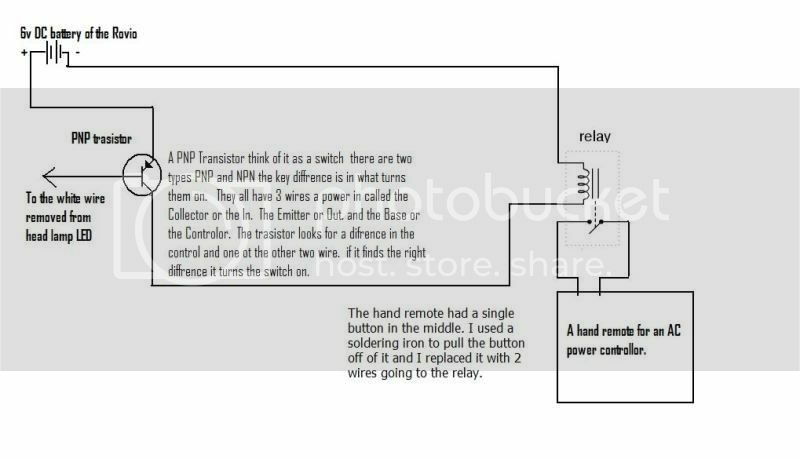 The just is that you pull the guts out of the remote and remove the button from the remote's board. Then you solder 2 wires into the two spots the button went to and solder those 2 wires to the Common and Normally Open pins on the relay. If you are working with a really with 4 pins instead of 5 just use the two pins that aren’t coil or control pins. That’s it. Now all you have to do is with the parts in the case. I trimmed the remotes housing and zip tied it to the power board and found spaces for the other components where I could. 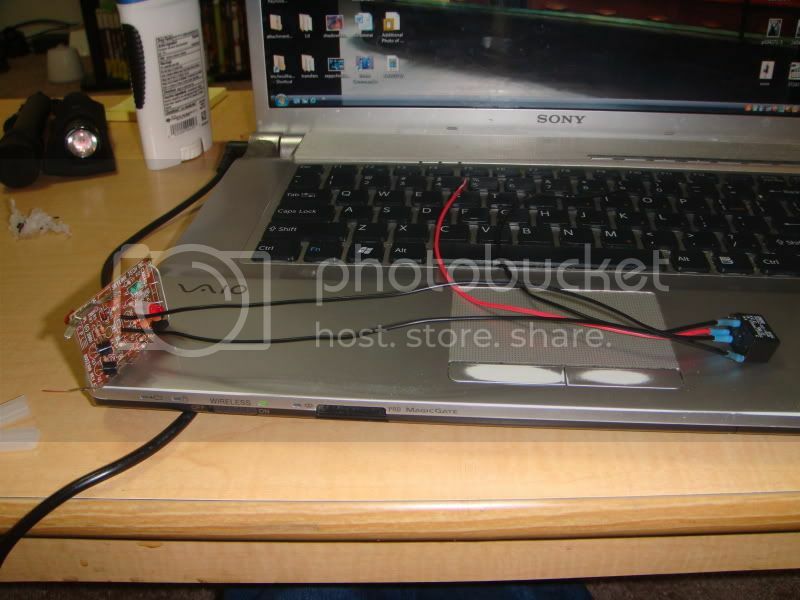 Just make sure to heat shrink all your wire and make sure that the remote board doesn't touch any other boards. You may need to put insulation around the remote's board. Then just seal it up and turn her on. I've Think that there’s some backing up of power. Mostly in my head but to be safe I've made a small change. 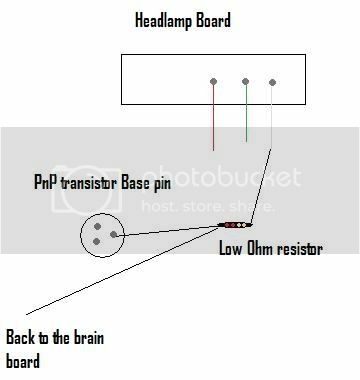 I've run a wire back to the headlight with a resistor. 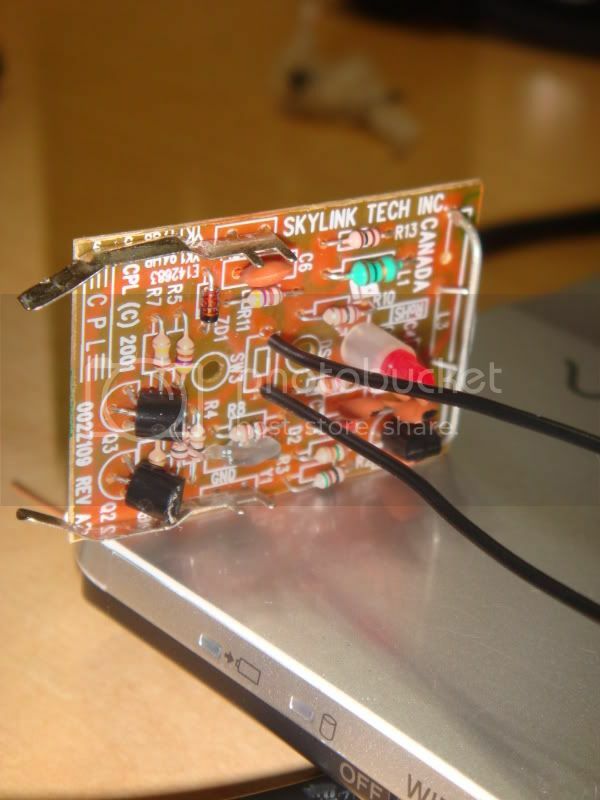 -Solder a small resistor 1 to 5 ohms to the end of the wire and heat shrink the solder and exposed wire. -Solder the other end in line with the white wire making a Y. So you should have the Base pin, the white wire that originally went to the LED and the remaining side of the resistor all joined. You may need to use small sections of wire, just use your best judgment on the how. I can't be sure but I think I was getting a drop out in the camera so this revision will dump any voltage leakage when the LED is off. Everythings is back inplace ans zip tied down. You can see the body of the remote at teh top of the picture or on the right side of Rovio straped to the power board. Its cut up to fit while still leaving plastic between the remote and the power board. Alway have to much wire so you can fit components where they don't get into moving parts or anything else. Absolutely ingenious mod. Awesome! Is there a way to power the transmitter by the rovio battery? This is WAY better than the "official fix" for the rovio owners that hack. Actuly yes you can power it from onboard the only resone I didn't is that the tansminter I bought turned out to need a 12V odd ball and the onboard is only 6. you can work around that with a small transformer but ya. I'm lazy? If you get a trasminter that is powered with less then six just add a resistor. I really love this mod, Thel - this is a very unique way to hack the Rovio. I'm going to turn this thread into an article for the site that will be credited to you, I hope you don't mind :) That way more members can see this awesome hack! You'll see it on the homepage when it's complete. Is that any chance I can get a hold of the manufacturer and make of the Rovio camra, maybe the manutatures literature? I'm 99% sure I can use the Master Mod to give Rovio to camra feed the norman one and say a low light black and white, similar to nightvision. Or jsut a look back feed for backin up. Please let my know if any one can get me some hard data. I'd love to try it. Very cool! please keep us up to date on your progress. this looks like a great way to drain the rovio battery even quicker than it already does. INGENIOUS! jpkira, it does not run off the rovio battery. This mod has its own power source. It wouldn't be hard to run this mod off the rovio battery which would not cause a drain since it is used only momentarily for only a few brief seconds. A running LED mod would use more power I think. Well now lets be not that witch we fear to be a mistake in another. JPikra the only time this mod draws off of Rovios main supply is when you activate the original LED. To operate you flash you Original LED (on) then (off) you then leave the LED off until you want the remote device shut down. Again it will be (on) then (off) as fast as you like. But yes if you use this and say turn the LED on it will draw power the whole time. And yes it will draw more power per unit of time. Those buttons on the operatorÂ’s page can be confusing I for one forget witch color means the LED is on alot. 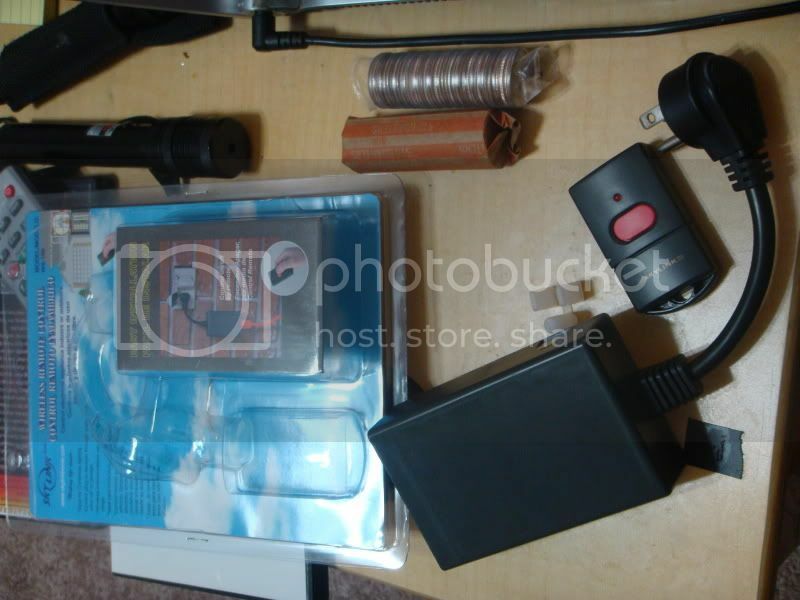 If your worried though I can share a mod thatÂ’s is a simple but beautiful way to use a mini maglight. It's completely free of the internal power using it's own AA's I recommend the LED Mini mag cause it lasts forever on a pair. The mag mod uses the positioning of the neck for on and off. Very cool. Has anyone tried rigging up a taser with one of these yet?